Would Hobbes approve of the Dow Jones bounce? As Art Scatter stoops to post, it’s a Monday night and all the major markets were up substantially, around 10 percent during the day, making up a big chunk of the beating they took last week. Actually, I hate to anthropomorphize the “markets” like that. Took a beating? I don’t think so. They are just numbers. We know how illusory they can be, right? Real and illusory at the same time. Neat trick. Do we think that the “fundamentals” have been fixed so everything is all right now? Pour a few hundred million into some banks, take an equity stake in them, and it’s all good? Art Scatter doesn’t know its economics but … all we can do is shrug. So, last night we were seeking solace in philosophy, the refuge of scoundrels. Often we turn to Rousseau — we don’t even really count him as a philosopher. “Man was born free, and everywhere he is in chains!” But we were in a darker mood. “Nature, red in tooth and claw” was more like it. That’s Tennyson, but he pointed the way to the philosopher we wanted. 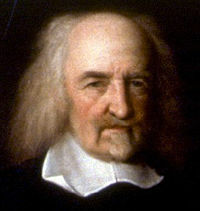 Thomas Hobbes: “the life of man, solitary, poor, nasty, brutish, and short.” Pretty close to “red in tooth” if you ask me. Arts and Letter Daily pointed the way. As usual. Because you can always count on that site to give you a good dose of neo-lib or even neo-con nonsense mixed in with the usual essays and reviews. 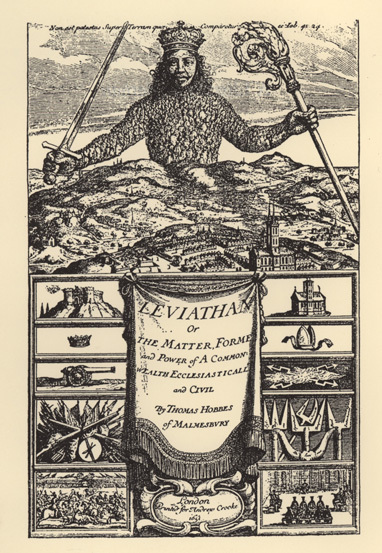 Sure enough, there was an essay by Peter Berkowitz of the conservative Hoover Institute, an introduction to a new edition of Hobbes’ Leviathan. I’m linking to it, but really, it’s ridiculous. He’s very selective about what he tells you about Hobbes (what about that whole censorship defense, for example?) and then devolves into an attack on contemporary philosophers for not taking Hobbes more seriously, but without citing individuals by name or trying to understand their reluctance to use Hobbes. Which part of Leviathan are they supposed to apply to their current practice? The part that says once you’ve accepted the protection of the “sovereign” that you have no further rights whatsoever? That’s quite a position for a Hoover Institution fellow to take. Or at least it once was. Now apparently, the whole “unitary executive” thing pretty much eliminates the need for those other pesky branches of government. Maybe even voting. Liberal political theory, at its best, is about how to make this difficult form of government called democracy work. Hobbes didn’t think it was possible, and it had to do with the “passions”, which led men (in nature) into a constant state of war: â€œCompetition of riches, honour, command, or other power, inclineth to contention, enmity, and war; because the way of one competitor to the attaining of his desire is to kill, subdue, supplant, or repel the other.â€ Only an all-powerful king (to Hobbes he’s the “sovereign”) can keep the peace, and in return for keeping the peace he demands… everything. Or at least he could demand everything. So what’s in there that could keep a decrepit democracy afloat at the beginning of the 21st century? Well, two things perhaps, Berkowitz suggests: Hobbes’ idea that only honest self-examination can reveal to us how powerful our passions are, how in need of a good caning, I mean a “sovereign”; and his ideas about virtue, which amount to a set of pleasant homilies about the importance of gratitude, mercy, forgiveness, modesty, etc. These virtues might keep the sovereign from caning you, apparently, but even if he did, as long as he didn’t threaten your life, you had no recourse. Democracy at work. We need political theorists because democracy so frequently does NOT work. Or rather, our passions distort it, deform it, block it, outflank it, outsmart it. Greed, fear, glory: Add them up and they spell power, and power destroys democracy, which is why political theorists are always trying to come up with a rationale for moderating it, keeping it in check, balancing the individual “pursuit of happiness” against the rights of others and the health of the whole. But it’s not a theoretical problem at heart. It’s practical, meaning we can’t solve it once and for all. The threats change. A rich man in Nevada can twist an election in Oregon his way, if he has a savvy enough ad campaign. How can we fix that? How do we overcome the ignorance of our citizens about their own democracy and how it works… or doesn’t? In a compromised democracy, how do we generate reasonable solutions to the problems we face? I think Hobbes would have thanked the king for today’s market bounce, pocketed his share, and gone about his business. Which toward the end of his life involved some far-fetched ideas about geometry. I hate that he was censored and threatened with charges of heresy for his views on religion and morality. I’m glad that his last years were spent translating the Iliad and the Odyssey. And I find him a fascinating character with an original turn of mind, both good reasons to read Leviathan, I suppose, especially in its historical context — which Berkowitz argues is simply not enough. Sorry, but I’m not persuaded: 17th century Britain is rich with stories and lessons for us all. Just not the lessons that Hobbes was teaching.